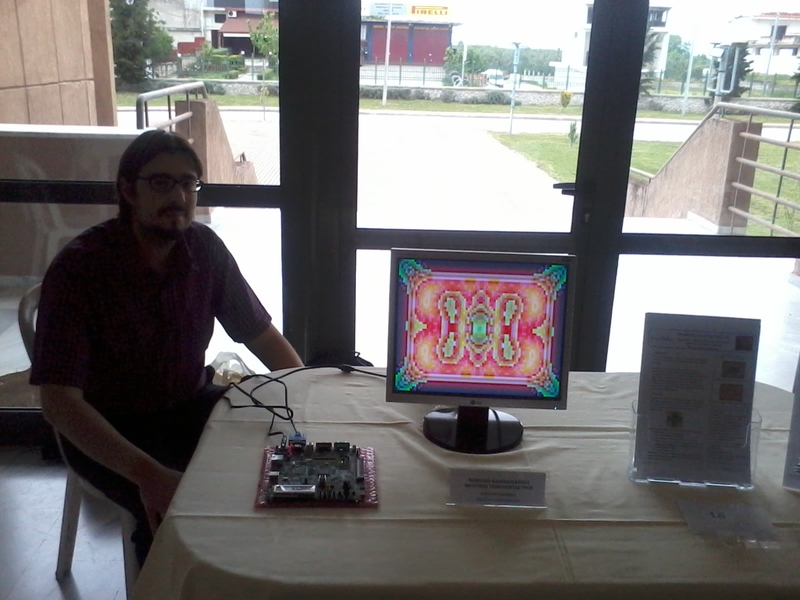 My first exhibition at a ROBO meeting was based on an all-digital, all-hardware demo based on 2D cellular automata. 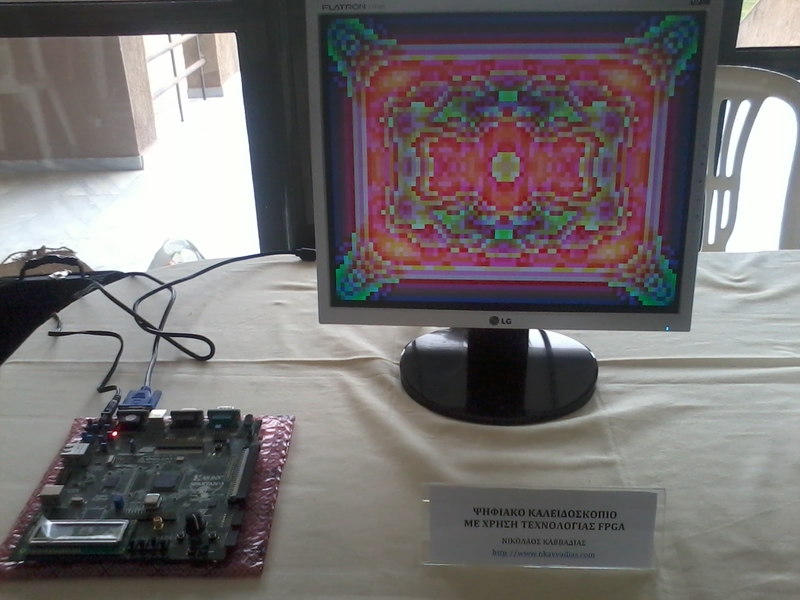 The demo was nicknamed “digital kaleidoscope” but the work was actually done by 2D automata using the so-called rug rule. Divide by 8 to get their floored average. Calculate the new value for the cell, C', by adding a small integer increment. This computation takes place in modulo 256 arithmetic. Wowa! That's a lot of stuff that went on in HercuLeS. It seems that it did the work. A self-checking testbench was also automatically generated by HercuLeS but we will not focus on that in this particular blog post. Technically, this is a single FSMD with separate processes for current state logic and next-state/output logic. Datapath actions are embedded within the next-state/output logic process, no messy code with concurrent assignments (has its pros and cons). Overall, the code closely follows the FSMD paradigm as presented in Prof. D. Gajski works and how this scheme was presented in Prof. Pong P. Chu's books (I own two of them). I had a great time with the exhibition, moving away from remote customer interaction (and their virtual whiplashes :) and meeting a lot of people in person, including school children, parents, technology afficionados, higher education students, hobbyists, local industry, teachers and professors. So I am thinking of a more impressive set of demos, like an algorithmically-generated 3D world which you can explore via a simple keyboard interface, 3D graphics demos (all done in plain hardware), chess engines, obscure IOCCC entries, etc. I am always collecting ideas across the web, especially "mini-codes" or "tiny-codes" that could be turned into interesting hardware demos.